Raw Duck Products There are 2 products. Our Moulard Duck Breasts come in two varieties, both of which are trimmed of excess fat for a higher yield of meat. 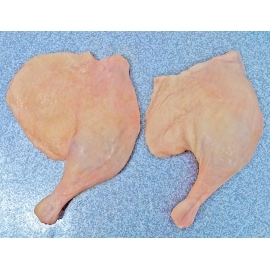 The Hen Duck Breasts have a net weight of 8 to 10 ounces per lobe and are Antibiotic Free. The Magret or Drake Breasts are much larger with a net weight of approximately 16 oz. per lobe. Both are raised cage-free and fresh-frozen shortly after harvest. Our Moulard Duck Legs are raised by the Hudson Valley Farm in Ferndale, NY and are a chef's favorite for confit or braising. The Hen Legs are 8 to 9 ounces each, while the Drake Legs weigh about a pound. Duck Wings harvested from our USDA All Natural Pekin Ducks. These are full size wings with 3 sections. Our Buddhist Duckling is processed with the head and feet left in place. This style is preferred when preparing a traditional Peking Duck. USDA inspected and certified All-Natural. Our Whole Bay Brand Duckling is fully processed under USDA inspection. Our flocks roam freely in spacious temperature controlled houses and are certified as All-Natural. Duck Tongues are the latest gourmet duck delicacy. Thanks to Hudson Valley Farms, we can once again offer Duck Tongues at a reasonable price. The count is approximately 75 tongues per pound. USDA All-Natural Pekin Duck Gizzards. Approximately 30 pieces per pound. Harvested from our USDA All-Natural Pekin Ducks. Approximately 25 whole hearts per pound. Duck Necks harvested from our USDA All Natural Pekin Ducks. Duck Carcasses are the leftovers from our processing line after the butchers have taken the prime cuts. A chef's favorite for making Duck Stock. The Carcasses are raw with no seasonings or additives. 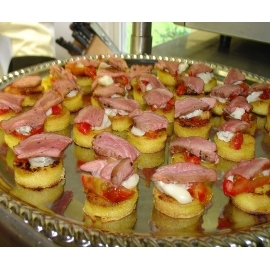 Our Trimmed Duck Meat is harvested from Moulard Ducks raised in Upstate New York. The meat is boneless and skinless and is mostly leg meat with just enough duck fat to blend nicely for charcuterie fares. Some of our accomplished chefs will confit this meat to make Rillettes or Duck Ragu. 10 Pekin Duck Leg Quarters averaging over 10 ounces each. The total net weight is at least 6.3 pounds. Hand-cut and shipped fresh on the day of harvest. 10 Boneless Duck Breasts weighing at least 18 ounces each. (That's a total of 20 lobes at 9 oz. each.) Shipped fresh on the day of harvest.